Radix Panax ginseng grows primarily in East Asia. Traditionally, the root is used for boosting energy and natural defences, for increasing physical and mental performance, as a general tonic for fatigue and as an aid to overcoming stress. Ginseng has been used for centuries in traditional Eastern medicine to replenish and restore the body’s natural reserves as well as to support sexual health. Its Latin name ‘Panax’ actually means ‘panacea’. Korean ginseng , like schisandra, is known in the West as an “adaptogen” rather than a ”stimulant” : in a general, non-specific way, these herbs increase the body’s resistance to various sources of stress (physical, chemical or biological) and to stressful situations. Taking ginseng thus helps the body adapt to active, modern life, by generally boosting resistance and increasing physical, mental and cognitive ability. With a regulating effect on certain organs (in particular, the hypothalamic-pituitary axis and adrenal glands) and on multiple physiological functions - while not over-stimulating or restricting normal functions - ginseng acts as a general tonic without producing any ‘rebound’ effect. It is particularly beneficial for the central nervous, immune and cardiovascular systems, for neuro-endocrinological function and for the metabolism of carbohydrates and fats. Radix Panax ginseng C.A. Meyer is the only ginseng registered in the pharmacopaeia. Its mechanisms of action are by no means fully understood but its therapeutic effects have been attributed to its active principles, ginsenosides. These act via different pathways and it is thought each may have its own tissue-specific effects. Ginseng’s ginsenoside content varies according to the plant species, age, part of the plant used, time of harvest and method of preservation and extraction. • The scientific literature has highlighted its anti-inflammatory and antioxidant activity, more specifically in the brain, attributing these effects to gut bacteria which enable ginsenoside absorption into the bloodstream and lymphatics for onward distribution to tissues. Researchers have concluded that such diseases as Alzheimer’s, which are primarily caused by cell death due to chronic inflammation and oxidative stress, could be controlled by appropriate, non-toxic doses of certain ginsenosides. • In addition, a number of studies have demonstrated that ginsenosides may modify neurotransmissions in the brain by affecting the release and reabsorption of acetylcholine and the number of choline absorption sites, particularly in the hippocampus and cortex. Ginsenosides thus affect memory and learning function and some of them may even be classed as nootropics. • Supplementing with this extract also helps the body increase its production of nitric oxide. This vasodilator effect, in addition to its benefits for cardiovascular health, also helps combat erectile dysfunction in certain cases, as demonstrated by a study conducted at the University of Ulsan in South Korea. • It has also been shown that some ginsenosides can improve insulin sensitivity in cells, an important parameter in all diabetics (or pre-diabetics). • Furthermore, supplementation with Radix Panax ginseng improves immune system function by increasing phagocytosis, NK (Natural Killer) activity and interferon production. • Other studies, conducted in 2007 at Hong Kong University’s Faculty of Science, have reported anti-tumour and anti-angiogenesis activity by ginsenosides. Angiogenesis is associated with many pathological conditions including tumour progression and cardiovascular dysfunction. With its high ginsenoside concentration, this Panax ginseng extract therefore acts on a number of parameters of overall health and well-being. Supplementation is recommended several times a year for periods of three weeks to a month, at a dose of two to four capsules a day. 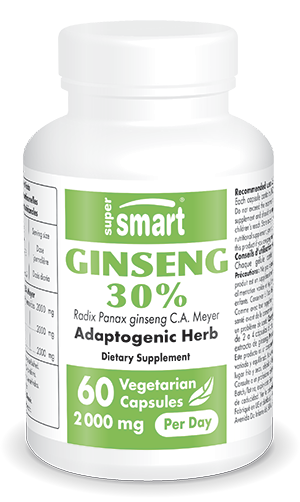 Taking Panax ginseng can be alternated with other dietary supplements that support the body’s general well-being. Extract of Cordyceps sinensis, for example, is a fungus renowned in Asia for its revitalising effects. You can benefit from the positive effects of pyrroloquinoline quinone (PQQ) in the supplement Mitochondrial Formula. Other ingredients: magnesium stearate, silicon dioxide, maltodextrin.